HomeSeer has been in operation since 1999. We manufacture home automation controllers and software and we distribute a full line of home automation products including lighting devices, thermostats, door locks, sensors and much more. Our main website is www.homeseer.com and our online store is http://store.homeseer.com. A free community message board is at http://board.homeseer.com. HomeSeer controllers are compatible with a wide variety of wireless and wired technologies including Z-Wave, Insteon, X10, UPB, PLCBUS, Nest, HUE, Sonos, IFTTT and many more. Z-Wave is the most popular automation protocol available now. Our controllers are compatible with all brands of Z-Wave products (more than 1,200 total, at this writing). What types of devices do you manufacture? What types of devices do you also provide? Z-Wave sensors from FortrezZ, Everspring, Aeon Labs and Ecolink; Z-Wave water valves from FortrezZ; outdoor intrusion detection products from Dakota Alert, Energy monitors from Aeon Labs, Current Cost. 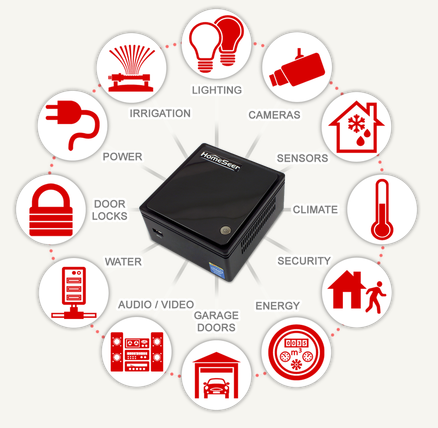 HomeSeer has been ranked #1 in home automation systems by TopTenReviews.com 2 years running (2014 & 2015). We manufacture advanced home automation systems for DIY home owners and for professional installers. Unlike the most recent crop of internet-dependent “smart hubs”, our HomeTrollers provide safe, secure and reliable operation at all times, with or without an internet connection. Our HSTouch mobile app runs on all Apple and Android devices and may be customized with our HSTouch Designer software. Our FREE myHomeSeer-Remote cloud service provides home owners with access to their systems from anywhere in the world with no monthly fees. HomeSeer provides unlimited support for our products. Dealer, Distributor and OEM inquiries are always welcome!